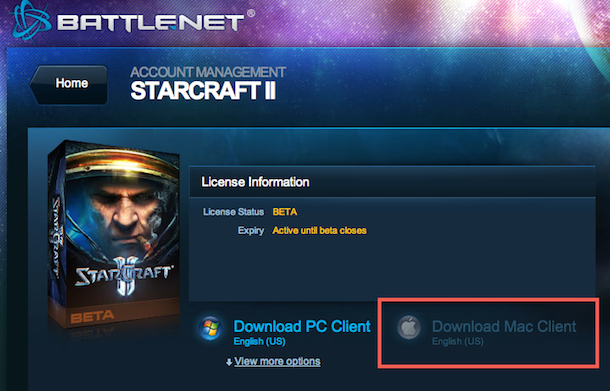 Starcraft 2 beta coming very soon for the Mac, pre-order now and get a FREE beta key! GameStop.com is offering a pretty cool promotion for those Starcraft 2 fans out there, if you pre-order the game on their site, they’ll email you a free key for the beta… this is particularly awesome since the beta is due out for Mac OS X very soon. According to Joystiq, Blizzard will be releasing the Starcraft 2 beta client for Mac OS X sometime in April, meaning very soon. Proof of this is on the beta client download page, where the Mac client download is visible but grayed out (see screenshot below). A thread on Battle.Net Forums indicates that the Starcraft 2 DVD will include both the Mac and PC version, so this would suggest the pre-order version available from GameStop.com would be that cross-platform installation disc. This is not confirmed however, so if you’re uncomfortable playing the game under Boot Camp than you might want to wait to find out for 100% sure if all Starcraft 2 installation DVD’s are PC and Mac since GameStop won’t refund the purchase once the beta key is mailed out. So if you want your Starcraft 2 Beta key, head on over to GameStop.com for the pre-order. The final version of Starcraft 2 is due out for both Mac and PC sometime this year. That grayed out button has been there for months. Amazon is also having the promotion along with a $10 coupon that brings the price down to $49.99. Discovered today that Best Buy has the same thing going on. Pre-order and you get a Beta key while supplies last. Can do in-store pickup as well. SO… i just pre-ordered… when do i get my beta key? it didn’t come with my confirmation, nor at any point during purchase did it inform me of when i would receive said beta key. thoughts? If I order the game from the us to use the key can I use it on the uk am be on the european sever ?